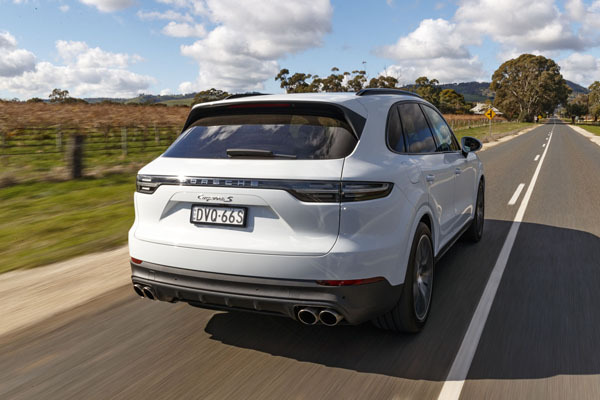 Porsche Cayenne generation three was launched in Australia in 2017. Virtually an all-new design it offers increased performance not only due to improved engines, but also reduced weight. Following the latest versions of the legendary 911 and the Panamera sedan, the new Cayenne uses a combination of alloys, aluminium and steel to keep weight down at the same time as strength is further improved. Fascinatingly, a lithium-ion polymer starter battery accounts for a weight saving of 10 kg over the predecessor. We have just enjoyed an excellent week in the Cayenne S, a vehicle that could be termed as the mid ranger in this gen-three Porsche. At $154,700 it sits above the $115,900 Cayenne 3.0 and is much more affordable than the Cayenne Turbo at $239,000. Note that on-road charges have to be factored in. 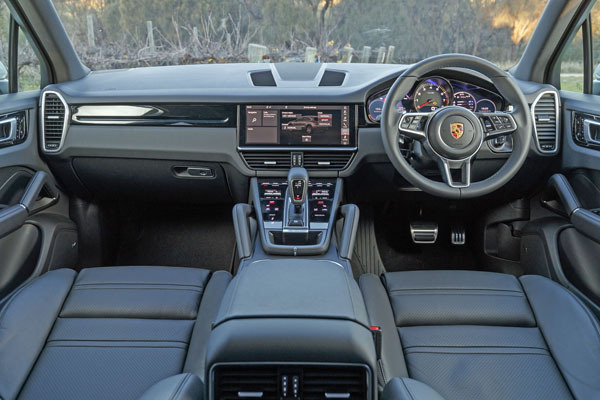 The shape of the third generation Cayenne is evolutionary rather than revolutionary, “Don’t mess with the 911” has been a threat from purist owners for many decades and that now carries over to the Cayenne, and indeed to all other vehicles in the Porsche range. It goes without saying that there are hints to the shape of the iconic 911 front and rear. Cayenne is sleek but still looks like an SUV, rather than a high riding coupe as is the case with some of it’s upmarket competitors. Having said that Cayenne three sits a little lower than the gen-two and is a touch longer and wider. The wider look is created by the horizontal grille and lights impressed all who saw our test machine. There are larger air intakes at the front that give it a purposeful stance. The now familiar taillight treatment that stretches all the way across the rear works particularly well. Materials are of high quality and the design and the way it’s all put together is impressive. The wide centre console really separates the two folks in the front, but it looks good and its multiple touch controls are easy to use. Then Cayenne S as tested has a 2.9-litre V6 biturbo engine that produces 324 kW. Using the Sport Chrono Package for maximum acceleration it jumps from zero to 100 km/h in just 4.9 seconds. The 3.0-litre V6 turbo-petrol in the entry Cayenne develops 250 kW, up 29 kW from the previous model. Somewhat confusingly, while all engines are turbocharged the topline model is the only one called Porsche Turbo. It has V8 4.0-litre twin-turbo with 404 kW of power and a huge 770 Nm of torque. Fire everything up with the Sport Chrono and the 100 km/h time is just 3.9 seconds, on your way to a top speed of 285 km/h. A new eight-speed Tiptronic S gearbox has faster response times and sportier ratios in the lower gears and an expanded spread, with the overdrive higher gears reducing fuel consumption and emissions. Event 6 of the Virgin Australia Supercars Championship, Winton Motor Raceway, Winton, Victoria. The central infotainment screen is large at 12.5 inches and simple to read at a glance. New Cayenne is always online if required. The expanded Connect Plus services are available through the integrated LTE-enabled SIM card. Porsche Stability Management systems are extensive and work with other built in safety features. There’s automatic emergency braking, lane change assist’, ABD (torque vectoring by braking), and an active bonnet that minimises damage to pedestrians and cyclists in a crash. Injury reduction is taken car of by full-length curtain airbags, driver and front passenger airbags, knee bags for the driver and front passenger, side-airbags in the front and rear. It might be an SUV but driving pleasure was very much at the front of the Cayenne’s designers’ minds. The engine in the ’S’ has plenty of grunt almost from the instant you hit the pedal on the right. The new design eight-speed auto certainly plays its part because it communicates with the engine’s electronics instantly to give ultra fast changes to the ideal gear. Hillclimbing is ridiculously easy with the big torque engine simply helping you lope up the rises. Fast overtaking is easy, with a minimum of time spent on the wrong side of the road. The sound of the motor once you do get stuck into it is impressive, though it doesn’t have the V8 beat of its big brother in the Cayenne Turbo. Handling is remarkably good for a high-riding wagon weighing in at two tonnes. You can feel the Cayenne gripping the road with ease at speeds that just don’t feel possible. And it feel good, too, the steering as plenty of weight and really does let you know what the Cayenne is doing. The front seats are large and comfortable and support well without being overly aggressive. The rear seats can carry three people but really are designed as two virtual buckets with a smallish centre seat. The back seats can be reclined and also juggled backwards and forwards to increase / decrease cargo space. Try this for yourself during your pre-purchase test drive – and don’t forget the family to get their opinions. The dash is clean and uncluttered and the electronic instrument panel in front of the driver provides a variety of readouts. 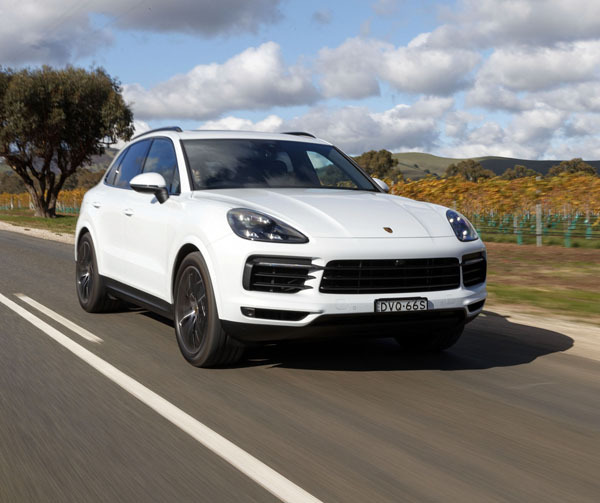 Porsche Cayenne is a brilliant compromise between a practical family wagon and a sportscar. The fact that it leans in the direction of sportscar would certainly earn it on our short list.